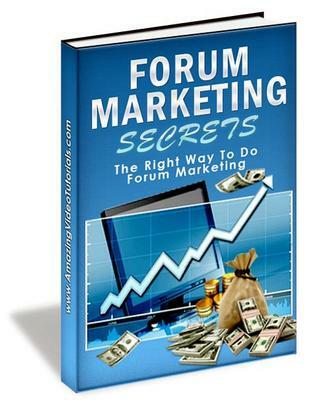 Dont be intimidated by the phrase Forum Marketing, it really isnt as hard as it sounds. In fact my videos make marketing on a forum as simple as tying your shoes! Some marketers out there are doing forum marketing, but they are doing it poorly, and not getting very many sales. Would you rather spend the next several months studying forum marketing and trying to figure out what works best, or would you prefer a faster method? There is a right way and a wrong way to do forum marketing (the wrong way would be sinking an endless amount of cash into lesson after lesson, wasting time or even ruining your reputation by not presenting yourself well on the forum, and not having a clear plan of action). * A Collection of 20 Professionally Recorded Videos, 80 Minutes of Content - This complete video series will teach you everything you need to know about forum marketing. * The Importance of Forum Marketing - Before you start marketing, you need to understand the specific advantages of forum marketing so you know how to make the most of your time. * Things You Can Promote with Forum Marketing - You may already have something in mind to promote, but if you dont Ill help you find something. * How to Find The Best Forums to Market On - Not all Forums are marketable, I will give you a checklist of things to grade each forum you come across, so you only spend time on the ones that will return the most profit. * How to Create an Effective Signature - I will show you how to create a signature that will grab peoples attention without being too pushy. * How to Establish Yourself as an Expert - I will show you how to get people on the forum to respect you, and value what you have to say (this is super-important if you want people to buy from you). * How to Find the Best Posts to Participate In - Not all posts are created equal! Learn how to spot the posts and threads that you absolutely need to be involved in, and how to stay away from those you shouldnt be. * How to Track Your Results - Not everything you do is going to work, it is so important to track everything you do so you can expand upon what works and cut your losses when appropriate. I show you how. * How to Explore a Joint Venture on a Forum - Joint ventures are one of the most valuable relationships you can establish. I will show you how to initiate one on a forum. * The Five Keys to Forum Marketing Success - Five simple rules you need to be following if you want to be successful with forum marketing.